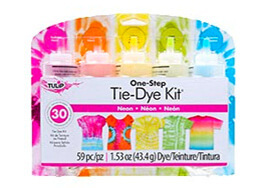 It's never been easier to TIE DYE YOUR SUMMER! Your satisfaction is a top priority for us, and we will gladly replace any product that you order from TieDyeYourSummer.com and receive in damaged condition. Unfortunately, because of the nature of our products, we are unable to offer returns or exchanges for any other reason. To be eligible for a return, you must provide a proof of purchase, as well as the unused damaged product in the original packaging. You may choose whether you would like a refund or a replacement product. To arrange your refund or replacement product, please contact our Tulip Tie Dye Your Summer Customer Loyalty Team for instructions on how to return your damaged product. When contacting our team, please include all relevant information about the damaged product, as this will be used in processing your claim. You will be compensated for shipping costs required to return the product once your claim is verified. If you have any questions or require additional assistance, please contact the Tulip Tie Dye Your Summer Customer Loyalty Team at 1.800.438.6226, Monday – Friday from 7:30 a.m. to 5 p.m. PST or info@tiedyeyoursummer.com.